EA Sports UFC is the first game produced from the partnership between UFC and EA Sports, revealed at E3 last year. 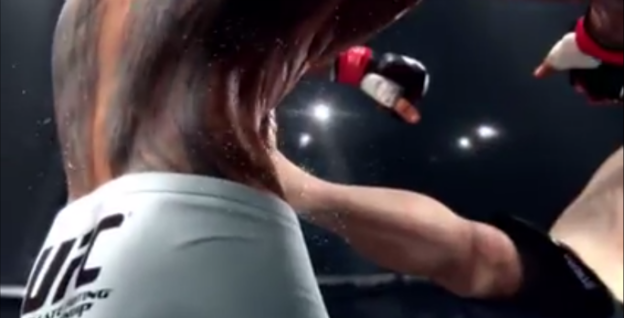 EA Sports UFC aims to represent its sport with both strategic and technical innovations. Chief among these has been dubbed MMAi, with which fighters behave in a manner based off of their real-life counterparts, adapting to the pace and scoring of the fight in real-time rather than sticking inexorably to a failing game plan. Additionally, UFC will have “Full Body Deformation,” intending to not only represent impacts but feature them prominently, including the visual effect they have on a fighter’s body. The team behind the game, which worked primarily on Fight Night in the past, has plenty of experience from their previous titles in making hand-to-hand combat viscerally appealing, if not uncomfortable to watch. If the trailer is anything to judge by, they’re ratcheting the visceral appeal up another few degrees this time out. EA Sports UFC is currently slated for a Spring 2014 release.